What if ICAC got it wrong on Oakden? Every individual Bruce Lander condemned in his Oakden report is now far from public view, as South Australians go to the polls on Saturday. But what if the ICAC got it wrong? asks InDaily reporter Bension Siebert. Jay Weatherill had one key defence during the remarkably short period of political fallout over last month’s ICAC report into the human catastrophe that was the Oakden Older Persons Mental Health Service. The Premier returned, again and again, to the fact that Lander had found none of his ministers, or previous Premier Mike Rann’s ministers, or any chief executive within SA Health, culpable for the systematic abuse of elderly dementia patients that occurred under what can only loosely be described as their watch, over more than a decade. They were certainly responsible for the quality of care at Oakden, as were many others, and ought to have known that the service was systematically, often criminally, abusive, and that it had been so for years, Lander found. But there had been a cover-up and they did not know enough about just how bad it was, so they escaped findings of maladministration. It’s by the Premier’s design that the full extent and quality of evidence that led Lander to absolve them remains secret. Forced by law to conduct his Oakden investigation in private, Lander lamented in the text of his final report that the public will simply have to trust that his investigation was fair; that those who copped maladministration findings were given natural justice during the process. Perhaps just as egregious: the families whose loved ones suffered horrendous treatment at Oakden can never truly know whether Lander’s investigation adequately scrutinised those who remain in power – those spared direct censure for their participation in the failed layers of state oversight that ultimately enabled the abuse. At the first Government press conference, two-and-a-half hours after the release of Lander’s 312-page report, journalists who cannot possibly have read every page by then could only, practically, fire questions at Weatherill on the working assumption that the commissioner got his findings right. In that adversarial context, it was up to Weatherill, if anyone, to defend his Government by arguing that Lander’s findings were wrong. But Weatherill spoke about that report like Mosaic tablets. “What the commissioner found…” was the constant refrain. So confident was Weatherill in the media’s structural reliance on the report’s veracity during those first few days that he borrowed its unquestionable reputation to support the absurd claim that the report, which argued against private maladministration investigations, was only further proof that maladministration investigations must be held in private. But the findings of Lander’s report deserve scrutiny of their own, and I think a little less reverence. Summarising his findings, Lander wrote that “each minister who had responsibility for the Oakden facility is responsible for its failures”. And successive ministers and chief executives “ought to have known” what was going on at Oakden, but they didn’t, which was “astonishing”. Yet all were cleared of maladministration. Under the ICAC Act, maladministration means “substantial mismanagement” in the performance of public duties or management of public funds. It can include conduct amounting to “impropriety, incompetence or negligence”. “A failure to act” is in there too. Far be it from me to dispute the former Federal Court Judge’s interpretation of the law. But in ethical terms, if those ministers ought to have known, but failed to exercise the curiosity required to know, doesn’t that equal incompetence? Or is the concept of responsibility within South Australian government really so empty? The answer to the final question is yes, Lander tells us – legally at least. According to his analysis of various court rulings on the subject, “a minister does not need to resign for failings which occurred within the minister’s department or portfolio without the minister’s knowledge”. Nick Xenophon has argued this provides an incentive for ministerial ignorance. The most recent former Minister for Mental Health, Leesa Vlahos, seems to have been relieved of the burden of her own responsibilities because someone else exercised theirs. In late 2016, Vlahos received the annual report of the Principal Community Visitor, which raised significant concerns about Oakden. According to Lander’s report, Vlahos did “very little” once she received that report and “very little thereafter”. Then-Mental Health Minister Leesa Vlahos (centre-right) answering journalists’ questions after the release of Dr Aaron Groves’ Oakden review. Vlahos suffered pariah status when the ICAC report was released because during the investigation she took credit that wasn’t hers, she shouted at the commissioner and she evaded questions and responsibility when she didn’t need to – but for the conduct that actually matters, her response to Oakden, she suffered no finding of maladministration. Lander says her “inaction” may have caused him to make that finding – were it not for the actions of Northern Adelaide Local Health Network CEO Jackie Hanson, who commissioned Chief Psychiatrist Dr Aaron Groves’ explosive Oakden Review. “I think Mrs Vlahos has been saved from a finding of maladministration by Ms Hanson’s action,” Lander wrote. Some may find this vicarious exoneration at odds with their own view of ministerial responsibility. It’s certainly at odds with mine. Hanson was applauded in Lander’s report for volunteering that she was ultimately responsible for what occurred at Oakden while others dodged responsibility, and he described her as “the only person who took positive action” when she became aware of the true state of affairs at Oakden. Another way to consider this evidence is that, while she had rightly taken positive action to fix it, Hanson conceded she was ultimately responsible for what occurred at Oakden. Lander found that, as CEO, she was responsible for the poor condition of the facility and, even though she did not know about it, the poor standard of care that was provided there – but she was not culpable for it. Lander made the same judgment of her predecessor, Margot Mains, who was in charge from 2011 to 2014. So Hanson and Mains were in charge of the Northern Adelaide Local Health Network, and that amorphous bureaucracy was found guilty of maladministration, yet they were not. I think South Australians expect better from those who lead. I think we expect executives to monitor intensively the quality of the public services we pay them so generously to administer, especially when the lives of our most vulnerable rely on them doing so. Groves, the head of South Australia’s mental health hierarchy, did more than most to improve the state of affairs for patients at Oakden, but failed to make any unannounced visits to the facility until Hanson asked him to investigate it. Groves told the ICAC that other agencies conducted unannounced visits to Oakden so, as the commissioner understood his argument, he felt that he didn’t need to conduct any of his own. Lander rejected that argument outright. “The Chief Psychiatrist had to discharge his own statutory responsibilities,” his report says. This seems difficult to square with Lander’s view that Hanson’s actions exonerated Vlahos’ inaction. Groves’ review, which broke the appalling scandal open last year, was only possible because of the persistence and tenacity of Barb Spriggs, complaining repeatedly to authorities, and eventually to the ABC’s Angelique Donnellan and Nicola Gage, about the treatment of her husband Bob at Oakden. Lander found that Groves’ failure to “take any action” in relation to Spriggs’ complaint between June and December 2016 was “indicative of a failure to exercise his statutory functions attached to his office”. Again, no maladministration finding. Groves’ failures were not substantial enough and his latter contribution was essential, Lander reasoned. Groves’ predecessors Dr Margaret Honeyman and Dr Peter Tyllis also failed to visit Oakden during their tenure. And all three Chief Psychiatrists knew of the appalling rate of physical restraint used on elderly mental health patients across South Australia, in comparison to all other mental health patients. In 2015, the annual rate of mechanical restraint at the Oakden facility alone was greater than the total rate of mechanical restraint at all acute mental health services in the rest of Australia combined. 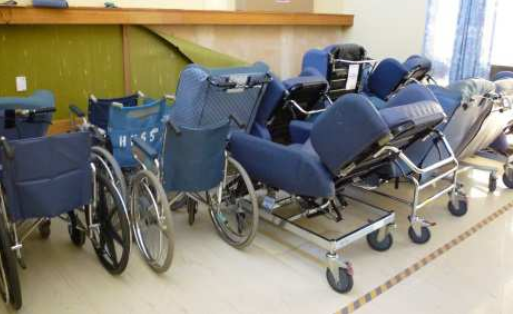 Damaged chairs at the Oakden facility. Photo from Aaron Groves’ review. As InDaily pointed out earlier this month, each and every Chief Psychiatrist’s annual report since 2010 has shown the disproportionate frequency of restraint used on older mental health patients in South Australia . Those reports were presented to successive Ministers for Mental Health: John Hill (2010-11, 2011-12), Jack Snelling (2012-13, 2013-14, 2014-15), Leesa Vlahos (2015-16) and Peter Malinauskas (2016-17), and to Parliament. Incredibly, Lander declines to make any criticism of Honeyman’s conduct because she wasn’t available to be interviewed. “I do not make any criticism of Dr Honeyman because she was not a witness and was not available to be interviewed on this issue,” the report reads. Tyllis, for his part, justified his failure to visit Oakden because what he knew about Oakden did not meet the “threshold” that would make such a visit necessary. Lander disagreed, but declined to make a maladministration finding against Tyllis because he had “no knowledge that the facility and the standard of care at the facility were sub-optimal”. No Chief Psychiatrist, responsible for monitoring the numbers on restraint and seclusion and for monitoring the standard of mental health care services across the state, had engaged in maladministration. And then there’s the Premier himself. His name appears in an appendix, listing the hundreds of complaints made to various authorities about Oakden over the years. Weatherill was the recipient of a letter, also addressed to then-Minister for Mental Health Gail Gago, which described “serious issues impinging on consumer and staff safety, staffing and training level issues (and) dated management systems” in 2008. The description bears a disturbing resemblance to what Groves found at Oakden in 2017. Weatherill has declined to release the letter – just as he refused to release any cabinet documents to Lander’s investigation. The letter is ignored in the body of Lander’s report. Lander says he considered it during his investigation, but will not explain its significance, or describe its contents any further, or release the letter, citing the privacy of his investigation. Maybe the letter wasn’t nearly as significant as it sounds, and the absence of any further explanation for it in Lander’s report is entirely justified as a function of the mind-boggling number of documents the commission had to process. And maybe those who have led our mental health care system, which failed so comprehensively over so many years, really didn’t know enough to be culpable, despite being responsible. Maybe each of them received true natural justice from Lander’s investigation. We’ll just have to believe him, he says. But we cannot possibly know. By delivering and maintaining Australia’s most secretive ICAC, the Weatherill Government has made sure that the families of those who suffered at Oakden, and the public, will never be allowed to know.